Velvet Paw Creations: "It's a Crow Party" Re-usable Dinner Party Place Holders for Lost Coast Designs DT! "It's a Crow Party" Re-usable Dinner Party Place Holders for Lost Coast Designs DT! It's getting so Christmasy over at Lost Coast Portal to Creativity with our Xmas celebrations underway....see my Day 1 of It's Beginning to Look a Lot Like Christmas projects if you haven't stopped by yet! 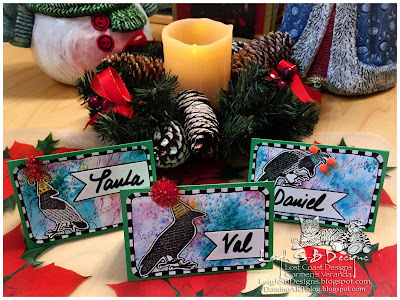 This is also the season for lots of dinner parties and guests need to know where they are sitting so how about making some fun place holders that are re-usable by adding banners die cut from Dry Erase White Board tape by Scotch! I made these for our new LCPtoC Challenge #31 for December...this month's theme is Party Critters! I used Nuance pigment powders by Magenta to create the yummy colourful background. I love the feeling of celebration they bring to my place holders, the burst of colours look like fireworks...perfect! I used 3 of the newest colours to the Nuance family: Aquamarine, Rosebud and Wisteria. You'll notice there's some extra colours mixed in there too...that's a little surprise you can get with the powders. Sometimes a speck of powder from another colour gets in by accident during production so you never really know what you're going to get until you start creating. But it doesn't always happen so each time you use the powders each result will have a different effect...I think that's fun and quite magical. You can get the Nuance powders at Lost Coast Designs too! 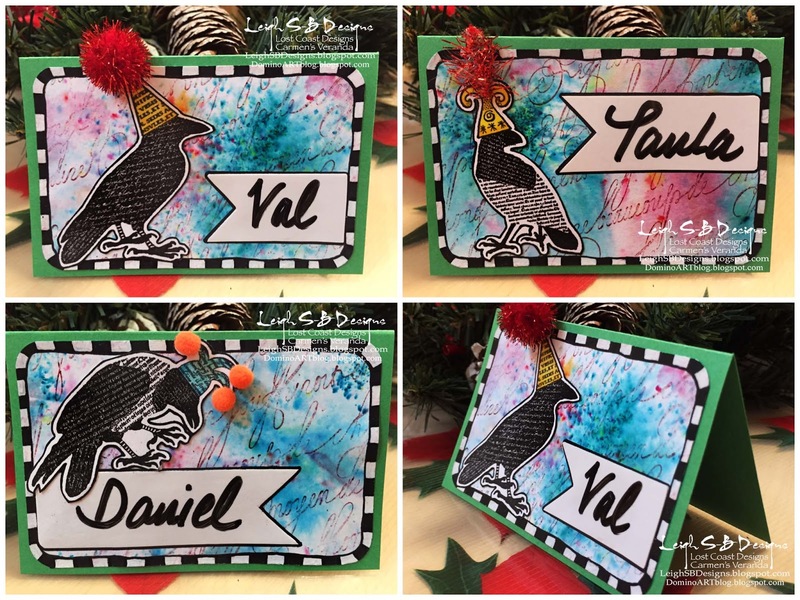 The crows were all stamped with Onyx Black Versafine ink and the Loopy Calligraphy background stamped with Aged Mahogany Distress Ink. I added touches of colour to the Crow's hats with Prismacolor pencils and embellished with tiny assorted pompoms and tinsel pipe cleaners. 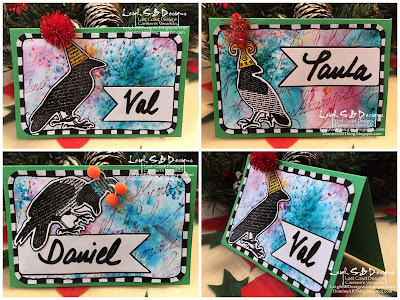 I used a Marvy corner rounder punch on the edges and doodled the black and white borders with Dylusions paint pens. I made folded cards from green cardstock and adhered the everything with Scotch Quick Dry adhesive.